- Dinko Predoević Oklopna vozila i oklopne postrojbe u Drugom svjetskom ratu u Hrvatskoj = Armoured units and vehicles in Croata during WW II vol 1-2, Rijeka 2002. - Tomislav Aralica: Hrvatski ratnici kroz stoljeća vol. 4, Zagreb 2011. Last edited by zastava128 on 16 Jun 2013 00:19, edited 1 time in total. Price for the Book is 1.700,00 Dinar. There is only 300 copy on market. A belated thank you, I'll be sure to check the book you recommended. I've been rummaging through various partisan reports, so when I'm done checking out all the literature I'll try to compile some sort of "master list". The 128 was the car I remember from my childhood hehe. IIRC there was at least one L6/40 captured by Slavonian Partisans, I think they named it Grga. There was probably other Italian tanks since 7th SS was reequipped with them in 1944. Biggest problem is to determine how long were these tanks in service, many broke down quickly or there wasn't fuel or ammo to use them and in case of tank unit of General Staff of Croatia got buried until they got fixed or fuel and ammo were captured. Thanks, yeah, I completely forgot the larger Italian tanks. Also I think Grga was used by the Zagreb partisan Corps. L3/33 captured from Italians, later also Croats, first in November 1941 in Montenegro. L3/35 captured from Italians, later also Croats, starting in spring 1942 in Croatia. This was, along with the L3/33 by far the most common captured tank. Over 50 in total were captured after the Italian surrender, but most were lost to the German counter-offensive that came soon after. L3/38 unknown origin, photos of this exist dating from October 1944, but there were probably some captured earlier. Rare. L3 Lanciafiamme captured from Italians after Italian surrender, possibly earlier in 1943. Rare. L6/40 first ones captured after or immediately before Italian surrender, later also from Germans or Croats. I've read 10 were present in Trieste in 1945, so total number was probably between 15 and 20. M13/40 one was captured after Italy surrendered, and one or two in 1944. One was present in Trieste in 1945. M14/41 I've seen it listed sometimes, but have found no evidence to support this. M15/42 first captured after liberation of Belgrade. It seems these tanks were only used for training, except maybe during the last few days of the war. Apparently the Yugoslav army had 12 of these operational after the war. Semovente 47/32 a few were captured and used by the First Tank Brigade in Bosnia near the end of 1944, and a few in Belgrade. The latter were used only for training it seems. Semovente 75/18 a few were captured during liberation of Belgrade, and more at the very end of the war. Used only for training it seems. Autoblinda 41 captured after Italian surrender and later. Probably between 10-20 in all. Fiat 665 and Fiat 626 (armoured trucks) as above. Somua S-35 captured from Germans, first one in October 1941 in Serbia, later also from Croats. Rarest of the French tanks, probably because most bridges could not support its weight. At least one served in 1st Yugoslav tank brigade. Renault R-35 captured from Germans, first one in October 1941 in Serbia. Only a few were used. Hotchkiss H-35/39 captured from Germans, later also Croats. First one in Serbia in October 1941, but this may have in fact been crewed by Chetniks. First confirmed partisan tank was in February 1943 in Croatia and served with the 1st Partisan tank company. Renault UE captured after Knin operation in late 1944. Not sure if armed or not. Renault FT-17 it seems one was captured after Italian surrender, but I've found no evidence of its use. More were captured near end of war as part of armoured trains. Panhard 178 I've found no details except that they appear in photos of partisan war booty in May 1945. Panzerjager 38(t) Hetzer a few were captured from the Germans and used in Croatia in spring 1945. StuG III F/G a couple captured after liberation of Belgrade, and more during the last week or two of the war. Seems used for training only. PzKpfw I? I've sometimes read about these being captured, but found no evidence, except for a single ammo carrier captured in early 1945. PzKpfw II J one was captured by Slovenian partisans in mid-1944, but I've seen no evidence it was used in combat. PzKpfw II C unknown number captured in 1945, no evidence of combat use. PzKpfw IV F1/G/H ditto. At least one was present in tank school in Belgrade in March 1945. After the war, Yugoslavia had a total of 25 of these tanks. PzKpfw V Panther G There's two undated photos (but clearly from 1945) showing partisans with a Panther in Srijem. No evidence of combat use. SdKfz 222 and various other armoured cars. No evidence of combat use. One report mentiones a 222 captured in May 1945. Sdkfz 250/251 There's evidence some were captured after the Knin operation in late 1944 and during 1945. It seems some saw combat use, including with the 1st Yugoslav tank brigade. One was converted to carry twin 120mm mortars. M3A1/M3A3 Stuart deployed to Yugoslavia in September 1944. Originally there were 59 of them, but it seems a total of 95 or so was supplied for the war (a few seem to have been acquired by "shady" means). Five or six had their turrets replaced with a 7.5cm PaK, two with a Flak Vierling. These were the core of the 1st tank brigade. M3A1 White Scout Car two were supplied with the Stuarts, but it seems four more were "acquired" by the partisans. Served in 1st tank brigade. AEC mk.II 24 supplied with the Stuarts. No replacements. Served in 1st tank brigade. M7 Priest 19 supplied in spring 1945. Mostly served as independent batteries in Slovenia and Croatia, or as part of the Heavy mountain artillery brigade of the 4th Yugoslav Army. M8 Scott 9 supplied in spring 1945. Served as part of the Heavy mountain artillery brigade of the 4th Yugoslav Army. Ford Canadian Lynx 2 supplied in spring 1945. Served as command vehicles for the M7s. Armoured car (unknown) - one "English" armoured car was apparently captured in late 1941 in Serbia, but this also may have been a chetnik vehicle. Fate and type unknown. Bren Carrier a few seem to have been scavenged from wrecked allied vehicles and repaired near the end of the war, mostly during the fighting around Trieste. 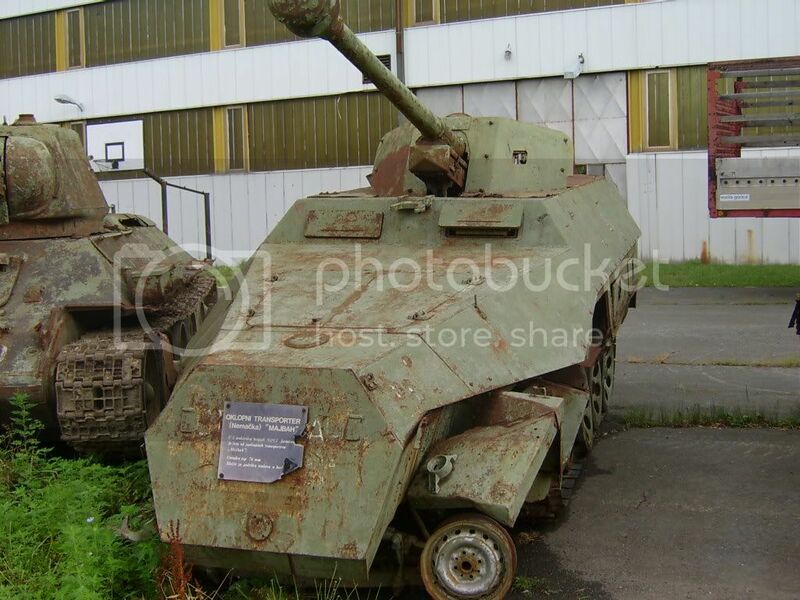 Photos show two such vehicles, both converted to bear German MGs. T-34/85 65 of them. The core of the 2nd Yugoslav tank brigade. BA-64 3 of them. Served with 2nd Yugoslav tank brigade. SU-?? I've read about a few Soviet SPGs being used, but found no data to back this up. Seems they were soviet vehicles that supported the partisans. T-34/76 5 captured from Germans in April/May 1945 in Slovenia. Saw combat. Tk-3 unknown number captured from Croats in 1945. No evidence of use. There was a photo circling few years back of at lest one Tiger captured in Belgrade but I doubt it was used even by Germans probably arrived from Romania (broken?) and was later hauled away by Russians which seems to have taken big part of war booty captured from Germans (at lest things they've considered to be worth something). Styer and Panhard armored cars (even some Tatra and Škoda) were used by Ordnungspolizei tank companies so they might cover some unidentified captured vehicles but these would see very short if any service due to lack of spare parts. Also from photos at lest one Sd. Kfz. 7 was captured at Knin and put to use while Soviets provided their ZIS-42 halftracks but I didn't notice any armor on them. Ivan Bajlo wrote: There was a photo circling few years back of at lest one Tiger captured in Belgrade but I doubt it was used even by Germans probably arrived from Romania (broken?) and was later hauled away by Russians which seems to have taken big part of war booty captured from Germans (at lest things they've considered to be worth something). There was one Kleine Tiger (Pz IF), and it is still in Belgrade war museum. There is some speculations about one Panther tank in Pannonia, but I haven't heard anything on Tiger. Vathra, the Panther (possibly even two) was definitely captured - there's two photos of Yugoslav Army soldiers posing with it (them?). I saw the Pz I but I have no idea about it's origin or use (Ordnungspolizei?). There's a couple of photos of the Panhard and Steyr in one issue of Panzerwrecks (No. 2 I think). Well I wanted to keep this to armoured vehicles only That said, I don't think anyone's compiled a list of soft vehicles used by the partisans, but Sd. Kfz. 7s were definitely used. I've even found one claim of a pair of Sd. Kfz. 7/1s with a Flak Vierling, but I think the author confused that with the converted Stuart-FlaKs. Source - Oklopne jedinice па jugoslovenskom ratištu 1941-1945. Strange, but the authors does not consider the German Pz-II-V. He attributes them to JA. Hello, this being my first post, I will keep it short. There is one SdKfz 251 in military barracks in my home town. Provenance is unknown, might have been captured, might have come after the war as a war reparations. So where are those Bren 13.2mm MG carrier photos? were they anti-aircraft?